Thank you to Jane Anthony and Mary Hustings for the following research. Harry Capon was born on 15th November 1880, the third of four children of Benjamin and Mary Capon christened at Christ Church. The family was then living at Sheep Green. Later they lived at Rowmount Farm. Harry was one of eight children. Like the Longhursts, the Capon family also had a long association with Coldharbour and the surrounding estates. Harry’s grandfather was a gamekeeper in Wotton. Harry was a farm worker, as was his father. Elder brother George was also a farm labourer and eventually Harry followed suit. A younger brother William became a domestic gardener and by 1911 had moved away from the family home and was living in Cranleigh. At the time of the 1911 census Harry was the oldest child living at home, his sister Ruth, who was deaf, and youngest brother Herbert were also there. His grandfather, who was 89, was living with the family. 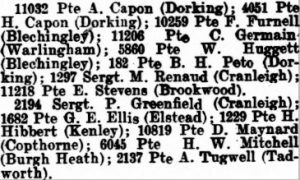 Harry Capon enlisted in the 1st Battalion Queens Own West Surrey Regiment at Guilford on the same day as Pte. Alfred Hunt. They both arrived in France on 21st April 1915. On the day that he was killed; 15th July 1916, his Battalion was involved in very heavy fighting at Bazentin. The most significant part of the action was at High Wood. A,B and C companies, with D company in reserve, were in position by 08.00 and the action started at 08.30, the objective was to capture German trenches 900 metres away. After heavy fighting all day, and when not more troops were available for reinforcements, the order to withdraw was issued at 18.30. The casualties from the Battalion that day were 5 officers killed and 11 wounded; other ranks; 28 killed, 52 missing and 207 wounded. Private Harry Capon was one of those killed and his body was never found. He is commemorated on the Thiepval memorial and at Coldharbour Church. He was 35 and unmarried.